Aaron Clausen is the Founder of NatureMapr, an innovative technology start-up that helps organisations collect, manage and analyse information from the natural world. As an active bushwalker and mountain biker based in Canberra, ACT, Aaron is constantly amazed by the treasures he comes across while exploring the outdoors. He has a particular interest in native Australian orchids but is learning about other species of plants and animals all the time. His latest discoveries can be seen here. 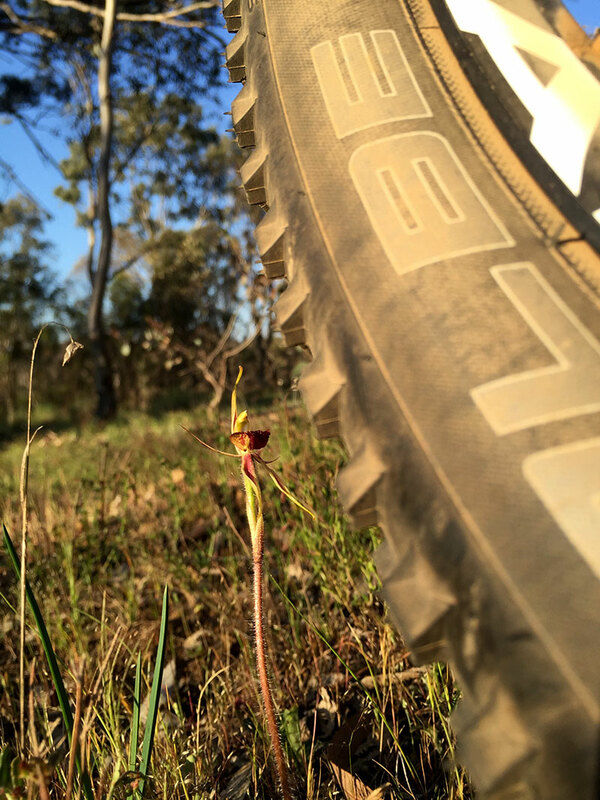 I was mountain biking in the Canberra Nature Park close to my home, which I always felt was just a patch of relatively boring bush consisting of gum trees and brown dirt, when I almost trampled upon and near destroyed a colony of the most critically endangered rare plant in the ACT – the Canberra Spider Orchid. I had no idea what they were, but I knew they were unusually stunning and unique – I’d never come across anything like it before. So I made some enquiries and was quickly put in touch with the ACT Government’s Conservation Planning and Research unit. And it turns out that they were really interested in knowing how many plants I’d stumbled across, where they were and what condition they were in. 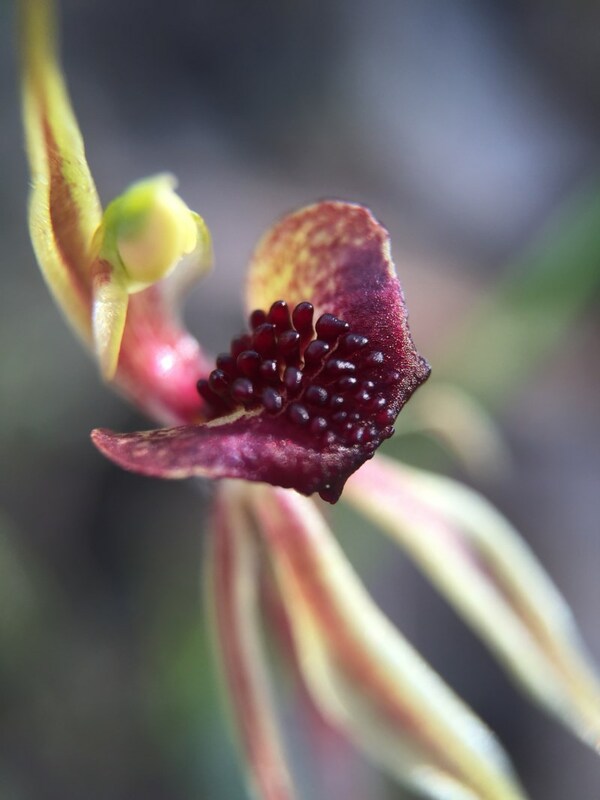 So I became very curious and began to look for more Canberra Spider Orchids as well as many other species all over the ACT. A whole new world was opening up to me and I never looked at the bush in the same way again. The vast amounts of information that I was collecting became too cumbersome to manage and so I piloted a rough online prototype over the Christmas holidays in 2013 to manage it all. I sent the link through to the ACT Government conservation officers that I now had this informal productive relationship with and as it turns out, they found it really convenient and started sending the link around to their colleagues. It grew very quickly both in terms of the participation from the local community as well as the technology stack that supported it all. I wanted to build a super easy / streamlined way to record hundreds of sightings on my smartphone, so that I could just click a button and have it all sync’d in to the people that needed to know about it for detailed analysis. We ended up with this really innovative and extremely robust platform that powered it all and so NatureMapr was established to make the technology available to other teams and organisations throughout the world. It’s something I’m very passionate about because I have seen the real world on-the-ground outcomes that are being achieved here in the ACT directly make a difference to many endangered plant and animal species. NatureMapr helps local councils, governments and environmental organisations around the world get those same benefits, which goes on to directly help the environment. It’s really simple – organisations who want to collect environmental records from out in the field, use NatureMapr’s tools to allow either their own team or the general public to easily collect and contribute field data, which we call “sightings”. Sightings are essentially photographic or audio records, accompanied by structured information that is entered into the mobile device or PC and includes things like GPS location, date, species, abundance, general comments and any special fields or attributes that the organisation needs to collect. NatureMapr’s tools run on both iPhone and Android devices and provide a robust data collection mechanism that is relied upon in remote areas, even in the complete absence of any mobile reception. The information is then sync’d back into the office, via a web portal that we setup for them, where it can be easily exported or analysed by our reporting tools. The web portal can either be completely private and hence available only internally to their team, or it can be a publicly accessible web site that encourages citizens within the community to contribute. Organisations pay based on the amount of information collected. We don’t charge them based on the number of users or contributors as we want them to get the huge benefits of having a potentially large, distributed contributor base – that’s the power of the technology. But if they find that they’re getting more and more out of it over time, by way of a large amount of valuable information being collected, then they may eventually need to increase to a larger sighting quota. It makes it extremely cost effective for smaller, community focused organisations who don’t have massive budgets to get up and going, but it also means we can provide economies of scale for larger organisations such as governments who are the heaviest users. We want to help organisations of all sizes, because by empowering them with technology, we know we are ultimately helping the environment and that’s what drives me. Right now we are working on a number of exciting projects including the expansion of the Canberra Nature Map project in conjunction with the ACT Government and ACT Herpetological Association, expansion of the national Koala Count citizen science survey for National Parks Association of NSW, and some other key initiatives which I plan to announce very soon. We’re also further extending the capabilities of the smartphone app on both iPhone and Android to become more and more sophisticated, as it’s become a critical tool relied upon by organisations in their day to day work. This year I’m most excited about expanding our customer base both within Australia and internationally. Our underlying platform can confidentially support that kind of growth as it reached a really important maturity point late last year. I want NatureMapr to become a successful Australian technology exporter that helps bring revenue into the country and create jobs for talented Aussie software engineers. In my business life to date I’ve done some things really well and other things terribly, and had to learn the hard way through trial and error. I work extremely hard and am focused on “doing”. Long hours, late nights, working right through the weekend etc. I’ve always done it, so I don’t really think of it as unusual. I also don’t tend to do much planning, instead I’d rather dive in, see how it goes and then change course if it doesn’t work out. And sometimes I’ve had to make some pretty heavy course corrections which have cost me a lot of time and money. But those are the battle scars that stay with you and guide the decisions you make going forward. I maintain a balance. Where as I might have worked through until 3am in my twenties, I simply can’t sustain that kind of relentless pace any more. I’ve become better at modulating my effort into bursts and taking important time out for regular exercise, relaxation and spending time with my wife. My hobby of searching for native orchids is like a form of meditation and always relaxes me. The other benefit is that I’m out there using my own tools and so come back constantly inspired with new ideas to improve the NatureMapr product. I make lots of mistakes, try to learn from them, then iterate and try again. A good example is pricing, I always find it really tricky to nail first time around. But you have to make a start, then you listen to customer feedback and sometimes just by osmosis the changes you need to make come to you in the shower and so I’ll go back and make those improvements until it’s right. I commit in full. Once I’ve decided that I want to complete a project or build something, I commit in full and am usually fairly intense in my approach to see the vision get realised. It becomes my main focus and while there are so many risks and question marks in business, I’m always the first to back myself and put my own personal funds and time on the table. Many people might rather buy another house or put every spare cent they get directly off their mortgage, but I really see value in building something bigger than that over the long term. I keep an open mind. You can never foresee everything in the beginning, but you have to make a start and then be open to new ideas, change and better ways of doing things. I’m always asking obvious questions and trying to soak up advice and insights from others. Mentors have been an enormous help to me and it’s something I regret not tapping into earlier. I have some amazing mentors, including some very senior people who I’m surprised even find time for me… But they do! Mentors can help provide guidance when you are at a critical point and need some grey hair to bounce things off. They can also get you into new, extensive networks that you may not have been able to break into otherwise. And the beauty is that all you have to do is buy them lunch every now and then. I try to exercise most days as I find it really keeps me feeling more energetic and healthier all round. This is typically a jog up Mount Majura in the morning, walking the dog or perhaps an afternoon mountain bike ride. More and more I make sure I take the time out for it. Once my work day kicks in, I essentially spend my time doing two main things. The first is talking to customers and the second is improving the technical product. I spend a lot of time just listening to customers, asking questions and trying to understand how to help them. Then I also spend a lot of time doing hands on software development and providing the technical vision for the product and where it’s heading. You absolutely need both halves in order to get your offering to product/market fit as quickly as possible, it’s the quickest way to iterate. Australia has a very high cost base and also the cost of skilled labour is very high. That’s both a negative and a positive, but it means that we essentially need to be as efficient as possible, automate whatever we can and I also have to be very selective with what I throw the highly skilled (and expensive) resources within my team at to work on. The way you can use that to your advantage during the early days is to supplement the product revenue with consulting hours and/or professional services provided by your start-up. Professional services and/or consulting pay really well in Australia and you can channel that cash flow into the build and continual improvement of your product which is the longer term investment. When you also see things like the gradual demise of the coal industry, which has been around forever, you realise that the economy has to evolve and we have to become an exporter of clever things rather than simply digging up dirt and importing everyone else’s technology. So the challenge has been that culturally, Aussies have been all about the digging up of the dirt rather than backing the clever things that can become global exports and bring money into the country just like the mining boom did. An idea is worth $20, maybe even $10 these days. Everyone has the killer idea. It just means absolutely nothing unless you personally commit for the 3-5+ years to actually go do it with the blood, sweat and tears required to take it to fruition. Execution is absolutely everything. That’s why technical founders who can cut code and help build the product as well as talk to customers are worth 3 x the weight of non-technical founders. In a small team with limited resources, you just can’t afford to hire people who can’t code. In the new economy, it’s a must-have critical skill, probably like using a word processor was in the 1980’s. I really love this company called Seeing Machines who are based in Canberra. They are exporting this brilliant technology to the world that prevents expensive heavy vehicles say in the mining industry from being damaged due to driver fatigue and their technology is now being extended to consumer vehicles. They are basically putting eyes and senses in these huge vehicles worth millions of dollars – their algorithms are preventing catastrophes from happening. That is very cool. Similarly, I can’t wait until we have fully automated, driverless cars as the norm. In terms of what NatureMapr is doing in the citizen science space, our platform is definitely the best in the world and we’re only getting warmed up. We’re essentially competing against ourselves as the other solutions I’ve seen are really clunky and terrible to use. We know that the days of white coated scientists being the only people who can contribute to formal scientific research are over and that organisations are waking up and seeing the huge benefits of letting anyone and everyone contribute data. It’s a trend we’ll see more and more of over the next few years. It essentially supercharges their available resources and we are determined to be the leading platform in the world for managing and executing all of that. Another fantastic Canberra-based business is Intelledox. They are another Aussie technology exporter who provide intelligent workflow automation software for large corporates. They managed to establish a strategic partnership with Fuji Xerox across Asia to help distribute their product. It’s just such a good success story to think that they have that global impact and are based down the road here in Fyshwick. Make sure you look to local solutions before you go off thinking you need to buy Nintex from the USA! Profitable business is so important because if something is profitable, then it’s also sustainable. So you can keep doing whatever it’s doing over time and keep increasing the impact it can make, because it is economically sustainable. Sometimes that’s a bad thing, e.g. oil rigs in the ocean are highly profitable, but what I really love is when a business is profitable, but it’s also doing good for the environment and / or society. In Japan they have actually regulated that company boards must have this mandatory role that is basically called the “company auditor”. The job of that role is to ensure the company is doing the right thing by the community and society at large and I just think that’s such a great concept. If I can say for every customer we sign up we are going to sponsor a local community group somewhere to plant some trees and we’re also going to give 1% of all profits towards key environmental causes, then that is hugely powerful. And it’s sustainable because profit is being generated so you can keep going without burning out or running out of resources. I am obviously passionate about the environment, I’m also passionate about Men’s health and raised a lot of money for Movember. My wife and I also participate in various charity running events throughout the year like the Mother’s Day Classic which help other important causes like Women’s breast cancer etc. But the poor old environment can’t speak up for itself and that’s why I love anything with a genuine environmental focus – we need to actively protect it and that costs real money. Can you name 3 Australians we should follow on Twitter? Yes, absolutely. We are always looking to grow our army of NatureMapr’s – these are individuals who simply love nature and want to help contribute to important citizen science projects. We care about what you see when you’re out exploring the outdoors and we need you to download the free NatureMapr app and start reporting! It’s free, it’s rewarding and it’s totally fun, but most of all you are contributing to real on the ground outcomes. Why do so many start-ups focus so much on raising investment funding, which is ultimately false runway, as opposed to simply trying to grow revenue while boot-strapping? I think the latter results in a more efficient business over the long term. The best success stories I know were all self-funded and/or bootstrapped. Xpresso Bar in the Canberra Centre. Their customer service is second to none and the coffee is awesome as well. They look after me every single day better than any other café.